Although a clean, simple CV layout is preferable, adding a few lines and playing with the alignment can really help accentuate the information you are presenting. 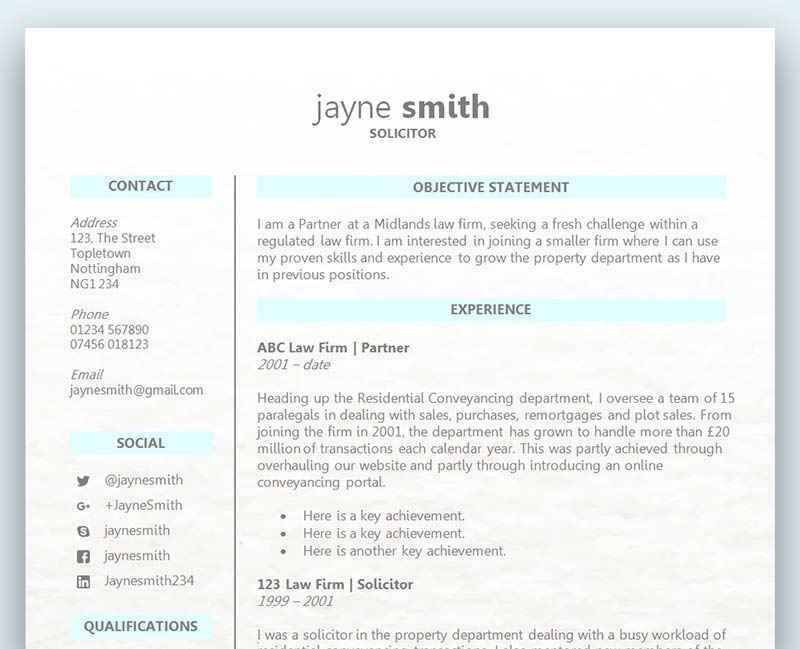 Our third version of our free simple CV template is perfect for just that. Version three of our Simple Word CV template	Overall rating:	4.1	out of 5 based on 6	reviews. Another fresh, clean CV template that is perfect for making a professional impression in a wide variety of job applications. This CV uses lines and alignment to accentuate your information and help your CV stand out. With a huge amount of applications now being sent to employer’s, it’s easy to see why producing a fantastic CV is an absolute must if you want to stand any chance of gaining that all important interview. It doesn’t matter whether you’re updating your CV or are writing your very first, we have three fantastic tips for you to help you create a fantastic CV that will get you ahead of the competition. Getting to know the company before you send your CV is essential if you want to not only create a great CV, but also give a fantastic interview. If you write a CV from scratch without using any knowledge of the company you’re going to be missing a huge opportunity. The same applies if you’re simply updating your CV, as a generic CV is not going to stand out. Every CV should always be written with the employer in mind making use of the job advert to construct an application that highlights all the relevant skills, qualifications and experience the employer is looking for. But the job advert is the tip of the iceberg, and conducting research into the company is going to make your CV shine. What product/service do they provide? How has the company performed in the last 5-10 years? For more information on how to research a company for your CV – click here. This might be an obvious one but you would be surprised how many CV’s are still littered with errors and are just not going to stand a chance. Even just one spelling error or fragmented sentence can be enough to instantly put off the hiring manager and end your chances of an interview. You’ll probably never even find out why you failed to get to the interview stage, and if you continue to send the same CV you are very likely to continue to struggle getting an interview. First of all don’t forget to use the spell checker in your word processor. It takes just a second to click a button and edit any spelling mistakes, and sometimes the spell checker will also give you a suggestion to change and fragmented sentences. Following on from tip number 2 – in order to ensure your CV is still completely free of spelling and grammatical errors, have your CV professionally proofread. There are some services online that will offer this, however we would recommend first of all trying to find someone you know who can help you. Search for someone who has extensive experience in hiring and reading CV applications. As an added bonus, if you can find someone that also works in the same industry as the role you are applying for, you will also be able to get some great tips on your content. Don’t be afraid to also ask your proofreader to offer advice on the overall content, quality, quantity, presentation and layout. And one final tip – ask them to check over your CV one last time once you’ve made changes based on their advice. Never assume your CV is good to go after your first edit, and always have it checked, double checked, and triple checked by a professional.